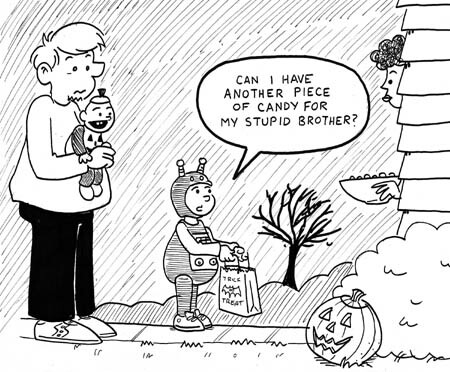 Yes, Elliot ACTUALLY said this when we took him trick-or-treating. Ellen and I stared at one another blankly for a minute or two, getting ready to play a game of “Who’s the Bad Influence?” when we realized that Elliot wasn’t being malicious. He was just quoting Lucy Van Pelt. Lucy says this line on It’s the Great Pumpkin, Charlie Brown when she’s out getting candy and Linus is in the pumpkin patch. Chalkboard post later tonight, but for now: Happy Halloween! I was the last generation of kids for whom home video wasn’t a given. By the time I was in junior high, VHS had pretty well taken over the world, allowing even the most meager of homes the luxury of making it a Blockbuster night. Moreover, as home video rental stores began to get a foothold in towns and cities across the country, the window between a film appearing on the big screen and in your local video store narrowed considerably. When I was a kid, however… this was not the case. If you wanted to see a movie, you saw it in the movie theaters. If you were lucky, a year or so later, it’d appear on HBO… and a year after that perhaps, on one of the Big Three TV networks. If you wanted to know more about that movie, you’d watch Entertainment Tonight. Many a Monday evening I remember spending glued to the television watching the ageless Mary Hart opine about weekend’s movie grosses. There was no immediate gratification of a home video release. There was no Internet to sate a budding cinephile’s interest in the making of their favorite movies. It was catch-as-catch-can. …and this is where movie novelizations picked up some slack. When I was growing up and you wanted to re-experience that movie you loved so well, they were the only game in town. Novelizations were written retellings of your favorite flick, normally based on the screenplays of major motion pictures rather than the finished product that landed in movie theaters. Stemming from this fact, movie novelizations were often rife with “bonus scenes” and extra perspective on characters in a flick, simply by virtue of having to be written months before the actual movie was completed. After all, a film novelist couldn’t know which scenes in the shooting script would end up on the cutting room floor. As a reader and a movie fan, I always found this thrilling. For instance, I remember reading Alan Dean Foster’s novelization of Alien 3 and enjoying it MORE than I enjoyed the movie at the time. 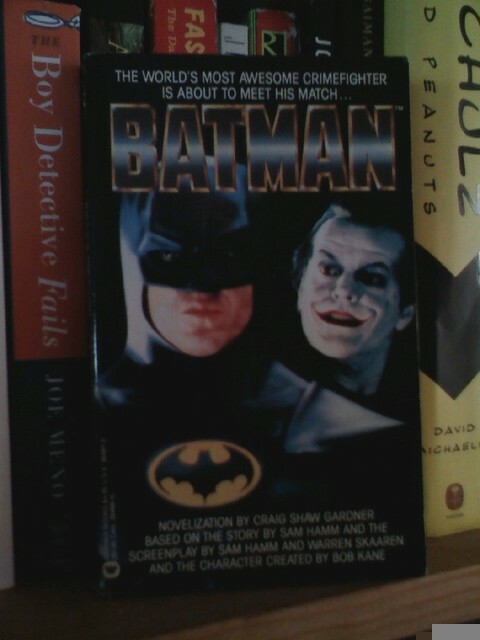 the novelization of the 1989 Batman movie by Craig Shaw Gardner. I’ve made jokes in the past about how this effectively absolves me of any responsibility about accuracy… but obviously that’s a “tongue in cheek” statement and I do try to get the facts right whenever I can. Unfortunately, I’ve missed the mark on a post and I wanted to take a second to clear the air. A few days ago I was contacted by Ms. Norma Martin, wife of famed MAD Magazine cartoonist Don Martin about some inaccuracies in my Thrift Store Find post on Don Martin Bounces Back... chiefly some of the legal wrangling surrounding Martin’s leaving MAD in the 1980’s for greener pastures. I’ve already posted Ms. Martin’s comments on that post, and I’m going back to that article this weekend and making the necessary corrections. I hope that my readers and Mrs. Martin will forgive my errors. My “sources” were a baker’s dozen of MAD fan sites and the guy who ran my town’s comic book store in the early Nineties… neither of which are the types of citations I’d want my students making on a research paper. I regret the error, especially as I hold Don Martin in such high esteem. Once again, I HIGHLY recommend everyone go and by The Completely MAD Don Martin collection, which is still available at Barnes & Noble for a song. It’s the best investment you’ll make in your personal library this year. I have to confess, it weirded me out how uncomfortable some folks became with the very reasonable request to refrain from using the phrase as a compliment. If, in your everyday life, a person you work with and liked asked you to refrain from saying something that made him or her feel uncomfortable… you’d just comply, right? Very simple… but since this IS the Internet, people found reasons to be outraged and complain. It seemed like the majority of complainers weren’t able to grasp the fact that, although intended as complimentary, it’s a very different compliment to receive if you are, in fact, someone who is capable of having babies. I’ve always thought the “want to marry/have babies” comment was quite reductive of a person’s talents, but I should mention that aside from it being a little sexist, I also have a personal bias toward this particular “compliment” as someone I went to college with would use it ALL the time. As in, “These chicken finger subs are so delicious I want to marry them and have their babies.” This person thought it was the height of cute and really drove my friends and I up a wall with it incessantly. Anyhow, I felt compelled to comment on it. I am sure my dozens of readers are happy to know my thoughts. 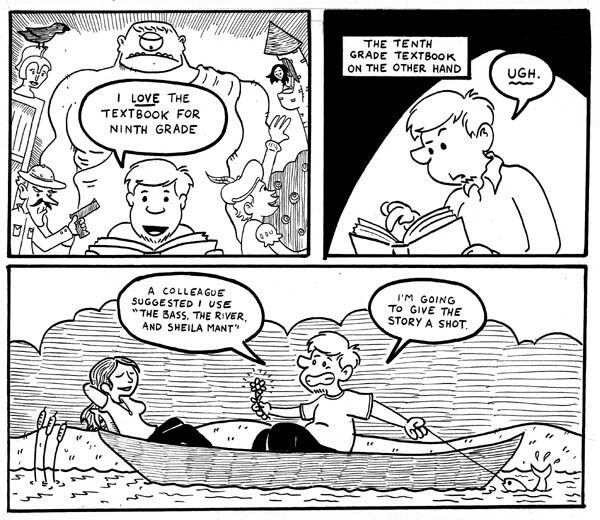 I should also mention that Kate Beaton’s comics are FANTASTIC. As an English teacher and a lifetime book nerd, her occasional forays into literature are some of the best comics I’ve read in long time. She recently delved into Dracula, but I still love her take on The Great Gatsby the best. 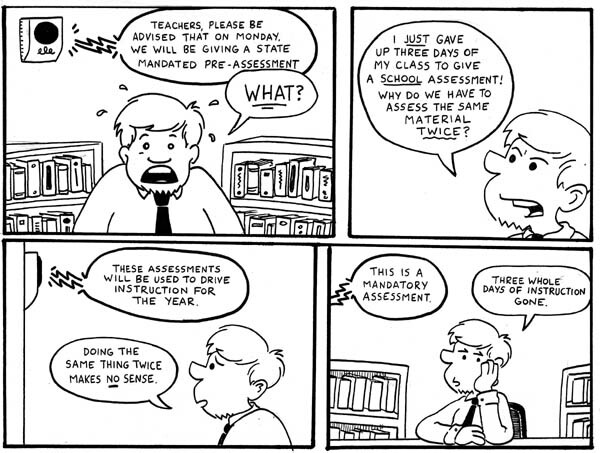 I took a long time to question whether or not I wanted to include this case of mismanagement in the comic strip. I definitely didn’t treasure the prospect of having to draw another couple of days filled with students taking tests; that wasn’t altogether interesting to me. I went ahead and decided to use this because it did end up becoming rather a large part of my classes at the beginning of the year. I think it goes without saying that this is but one piece of a much larger puzzle that I’ll be sifting through as the year goes by… hopefully it doesn’t come off as overly negative! 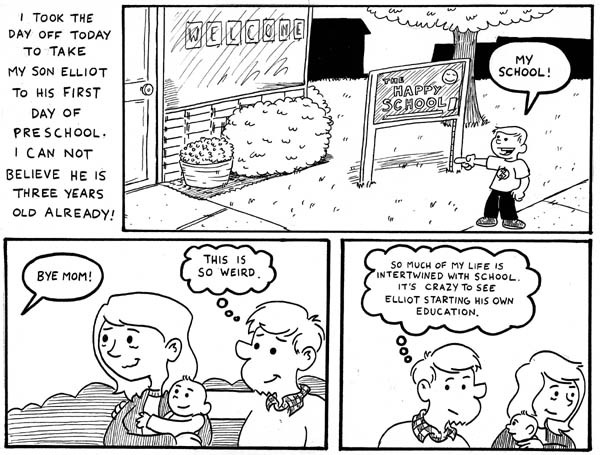 Obviously the name of Elliot’s preschool is made up… but I was surprised that most preschools around here DO have names like that. Happy Acres, Smile Junction, that kind of thing. The Bass, The River, and Sheila Mant is by WD Wetherell, if you were interested. It’s a pretty good story, I have to admit. There are some… issues with Wetherell’s prose that I’ll talk about in a comic next week. Hey, it’s that time again: If you’ve enjoyed the comic over the last two years and you’d like to support my classroom, please click over to our DonorsChoose page and throw a few shekels our way. DC has an amazing “Almost Home” grant going on right now, whereby all of our projects are within $100 dollars of being funded! That’s a lot of new books for our classroom’s lending library! Please give what you can. You are currently browsing the Teachable Moments blog archives for October, 2010.